Pro speakers package is a standard Wedding, Special Event, Performance and Band rental. The system works with your smartphone to play music Apps such as: youtube, pandora or spotify. It also connects with a computer (Mac or PC), ipod, SD Card and other digital devices for music playback. For live music amplification you can upgrade your Mixer box and have access to the full capabilities of this speaker package. Furthermore, the included microphone allows you to make announcements, toasts and hence Emcee your event. **Notes: rental requires power and speakers. The mixer box allows for easy sound control and has plugins for musical equipment, mics and instruments. Delivery is not included, set-up is ground floor only (no stairs/steps). Speaker Specs: JBL EON 612 Speakers, Built in Class D amp, 1000 Watts, 12″ Driver. 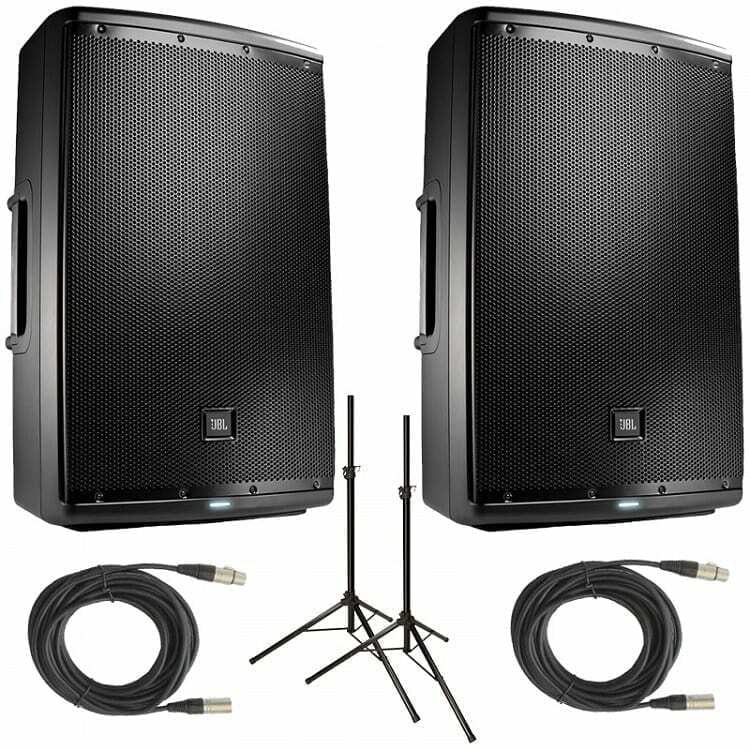 Overall a great sounding system perfect for parties and events! Finally, for the AV pro, daisy chaining for monitor use or for delay system is possible. *Click here for DMX controller or DI Box rentals. Please watch video for more information. *We also rent mic stands, portable stages, gobo projectors, and followspots. All equipment listed above is available by the piece, see A/V Rentals for options.